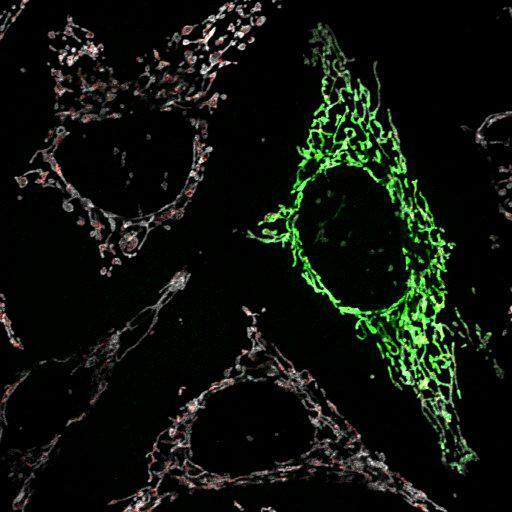 Mitochondria in HeLa cells are identified by mito-YFP (green). When fixed cells are permeabilized with 0.005% digitonin, the antibody to cyctochrome c (red), a mitochondrial matrix marker, is unable to reach and bind cytochrome c, but the antibody to Tom20 (white), a mitochondrial outer membrane marker, is now able to bind Tom20. Mito-YFP transfected HeLa cells were treated with DMSO for 3 hrs, fixed with 4% paraformaldehyde and permeabilized with 0.005% digitonin/PBS. Primary antibodies used were: anti-Cyt c mAb (BD) and anti-Tom20 mAb (BD); secondary antibodies used were: Alexa Fluor 594 and 647. Imaging was performed on an LSM510 Meta (Carl Zeiss, Inc) with a 63x 1.4 NA oil differential interference contrast Plan Apo objective. Image contrast and brightness were adjusted in the LSM image browser (Zeiss). This image corresponds to Fig 4b, 2nd row from top and is part of a differential permeabilization assay with and without the mitochondrial depolarizing agent CCCP (carbonyl cyanide m-chlorophenyl hydrazone) that is further described in Fig 4b of J Cell Biol, 191: 933-942, 2010. Images in Fig 4 include CIL#s 13733, 13734, 13729, 13730, 13731, 13732, 13717, 13718, 13719, 13720, 13721, 13722, 13723, 13724. J Cell Biol, 191: 933-942, 2010.